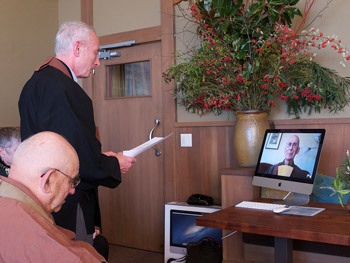 In a modified ceremony on Sunday, December 15, Abbot Steve St�cky formally stepped down from his position as central abbot of San Francisco Zen Center. After a diagnosis of stage IV pancreatic cancer at the end of September, Abbot Steve�s health has been steadily declining over the last two months. 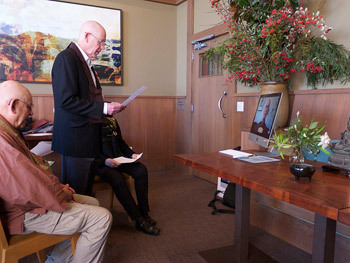 As others in SFZC leadership began sharing some of the duties he could no longer fulfill, a stepping down ceremony came into view, though the specific timing remained fluid until both Steve and other SFZC leaders came to a mutual decision that the time was right. 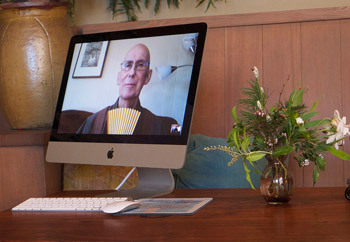 Beginning at 2 pm last Sunday, the ritual was completed via Skype between San Francisco and Abbot Steve�s Sonoma County home, in order to allow him greater comfort and ease. 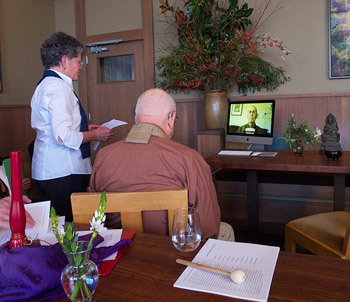 This somewhat unorthodox meeting of tradition, intention and circumstance made it possible still to hold a deeply intimate space for the occasion as Steve and others reflected on his legacy with tenderness and gratitude. 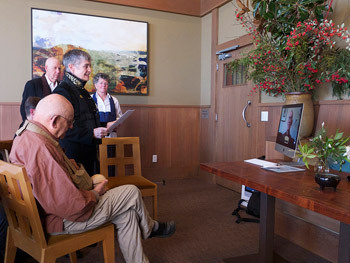 Ordinarily such Zen Center ceremonies are public events with statements made by people in several key roles. However, due to Steve�s condition, a public event was not feasible, and even having a small group at his home for the ceremony eventually seemed too taxing on his energy reserve. Thus, effort was made to abbreviate the usual order of events and to have Steve participate remotely. Originally planned for December 8, the ceremony had to be postponed once due to a sudden hospital visit about that time. While Steve and his wife, Lane Olson, remained at home, the other small group of participants gathered in a private room at Greens Restaurant in San Francisco. The venue provided both a lovely setting and a logical meeting point, as it was hosting a separate SFZC Board event later that afternoon. 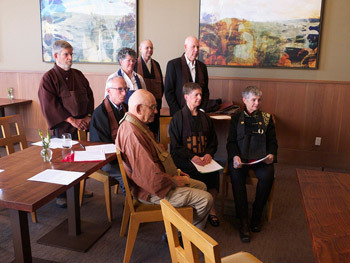 The participants, condensed to nine, consisted of Abiding Abbess of Green Gulch Farm Eijun Linda Cutts, President Susan O�Connell, SFZC Board Chair Mary Morgan, City Center Abbot Elect Rinso Ed Sattizahn, Senior Dharma Teacher Sojun Mel Weitsman, Steve�s dharma heirs Renshin Bunce and Christine Palmer, and close friends Steve Weintraub and Bruce Fortin. 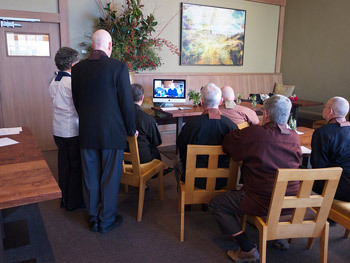 During the ceremony, Abbot Steve gave his full energy to the moment, sitting upright with joyful attention throughout the nearly hour-long ceremony. Preceding his statement with traditional waves of the teaching wisk, he later set it aside and instead took up the fan while receiving the other statements of appreciation, a gesture symbolizing his release of authority. In these statements, recorded and unrecorded, expressions of love were freely exchanged. Finally at the well-being chant near the end, Abbot Steve sat back on his couch, closed his eyes and simply took in the wholehearted offering of the group. 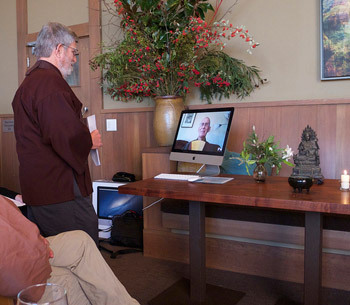 Reflecting the wish of Zen Center�s leaders to include the sangha as much as possible in this unusual and significant occasion for the community, Sunday�s order of events is replicated below along with the text of many of the statements that were given, including Abbot Steve�s own, which expressed some relief as well as confidence in the next central abbess. 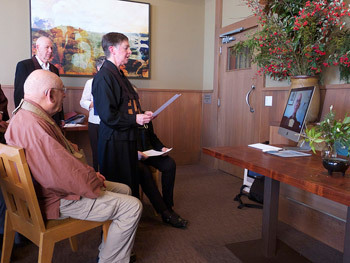 His duties and responsibilities as central abbot are now being carried out by Eijun Linda Cutts, who at the same time is continuing as abiding abbess of Green Gulch Farm until the installation of the next Green Gulch abiding abbess on March 2. 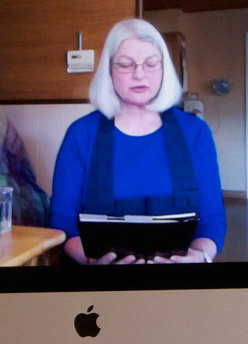 A public installation ceremony for Linda as central abbess will be scheduled and announced in coming weeks. NOW, dear friends and colleagues, we are ritually acknowledging that I, Myogen Steve St�cky, am stepping down from the position of Central Abbot of SFZC � stepping down from a Mountain and re-entering the flow of the wide, in fact boundless River of Sangha. This ceremony has this power to relieve me of all the responsibilities of this office. And I do feel relieved, as well as a mix of many feelings that come and go. I invite all of you to join me in the practice familiar to us all, the practice of acceptance of all that this moment brings (this is the practice of Mountain as Wisdom, based on the confidence in the non-dual True Nature of things), and with this acceptance, the positive energy of the Bodhisattva Vow, asking �how can I be helpful?� This is the practice of River as Compassion, fully participating with people and situations, with the fast-flowing, sometimes surprising and confusing Dance of all our lives. To acknowledge all feelings for me now means to accept and re-accept the diagnosis of Terminal Cancer, a condition that just 12 weeks ago (as we say) pulled the rug out from under me, and because this rug is shared with so many others, has rippled and continues to undermine all conditional relationships and sends shockwaves to the depths of many of us. As we know from all our study, the teaching of �transiency� is not something abstract but powerfully knitted into our bones. So my death asks so much of you. Please accept this as a teaching for yourself and for our Sangha. Accept with gratitude. And please accept my gratitude for the confidence you showed in inviting me to this position on the Mountain. It was courageous of the Elders seven years ago, and surprising to most of the sangha at that time. Please accept that I made a great effort to answer that invitation and wholeheartedly take up the position with the thought that I could perhaps be helpful, and that perhaps I have been helpful sometimes, and please forgive me for my many failures, failures of day-to-day missed opportunities to meet you fully�and now, please forgive me for leaving so abruptly. Now, Today I am also so Grateful for this chance to say that this precious time I have been given has been a great Blessing and chance to Savor and Enjoy this life. I have loved every minute of this time as Abbot (though it did not always feel like Love). I have loved the spacious, boundless view of a Great Future for Zen Center, a sense that SFZC has a mission of making a priceless jewel available to the world, and that the fundamental practice that we hold dear can be fully realized and be a way to face the fears that beset suffering human beings�and be relieved of suffering not by turning away but by turning toward what is most difficult. Given all boundless support by the Undivided True Nature of things, support that is evident and manifest in you in the way each of you has supported and continues to support me now, I feel so blessed. I can say that I have been a Happy Abbot. And now I am relieved and happy, delighted and Joyful to pass these many blessings on to Eijun Linda Ruth Cutts, who has been so generous with her life as to accept the responsibilities of this Mountain, perhaps appropriately a kind of side-step over from Green Dragon Mountain. When I contemplated the impact that my abrupt departure would have on all of Zen Center, and who could possibly step into the Breach, my thoughts turned again and again to Linda Ruth. Of course, she brings all the qualities and has been tested in many situations, and has the stability of practice, great experience in the past several years already working closely with the Officers of Zen Center. BUT would she, could she possibly accept this huge shift and, in many ways, Unknown responsibility? 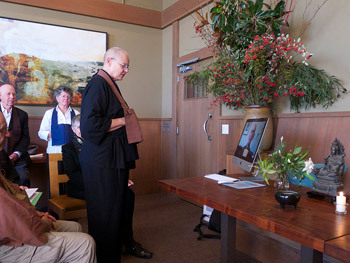 I was greatly relieved and delighted at her positive response, that her willingness and deep dedication will now be evident in sustaining this wonderful field of practice that is San Francisco Zen Center, and that includes a field of relationship with growing members, affiliated sanghas, and the environment itself. I do Now step down. On behalf of the entire Board of Directors�past and present members�I want to express our profound gratitude for your service as Abbot of Zen Center. As co-abbot, you worked diligently with the Board and the Elders Council to create a new structure for Zen Center�s leadership, one that would care for each practice center and Zen Center as a whole. You took on the role of Central Abbot with enthusiasm, humility and perseverance. We have all benefitted from your commitment to see things as it is and to knit the sangha together with threads of love and non-abandonment. When fire began its journey down into Tassajara Valley, you sat with it and steadfastly protected our beloved monastery. You have not merely had the title of abbot; you have been abbot to your very core. Thank you so much for all your efforts on behalf of Zen Center. You have touched the lives of many. You have been a profound encouragement to everyone�s practice. Eihei Dogen wrote this poem to accompany his portrait. I offer it to you. Fresh clear spirit covers old mountain-man this autumn. Donkey stares at the sky ceiling, glowing white moon floats. Nothing approaches, nothing else included. Stepping down, dissolving into love. Seven years added to 40 years of dedicated practice. From the beginning your everyday shining Samantabadra practice encouraged us all, and today shines brighter than ever. Fully given, nothing held back, with great joy you served as Abbot. It has been a great pleasure and honor to work with you the last seven years. I had cherished the thought of sharing the abbatial responsibilities with you, the Central Abbot, when I became City Center Abiding Abbot. But that is not to be, so now I will carry you in my heart and practice with you in a different way. There is no end to our practice together. As I reflect back over our 43 years of rich karmic intertwinement many memories arise: plowing and tending the fields together at Green Gulch as new students, our first practice periods at Tassajara and then our ordaining together, and our meetings together over the years in our �Old Zen Men�s Group� where we cooked for and got vulnerable with each other. And these feeling arise about you: your unflinching, passionate, dedicated, joyful commitment to the Dharma, �to a path of wisdom, truth and compassion. The I Ching says �perseverance furthers.� It has for you and the Dharma. Your life has turned the Dharma and the Dharma has turned your life. 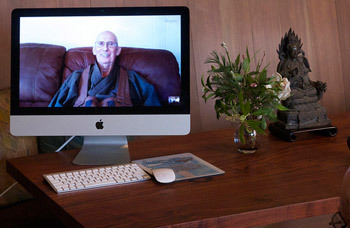 You have become the real deal, a Zen, Dharma teacher in the fullest sense of the word, deeply admired and respected. �And now a quick story: it was my first practice period at Tassajara, and I think yours. The two of us took a hike to the Wind Caves on a day off. Sitting down to lunch, I noticed you bowed to your sandwich and said a little blessing. Wow, I thought, you can do something like that, express gratitude, even outside the Zendo. I have thought about your example of gratitude many times over the years, sometimes while eating a sandwich driving. 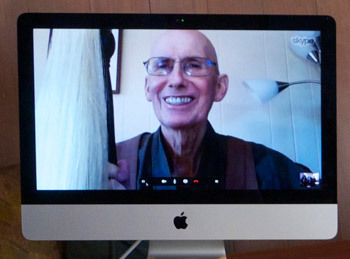 So my deep bow of gratitude to you, Steve, for your Dharma service, for your teachings and for your friendship. In action and speech deeply imbued with the spirit of practice. And the way you did what you did is beyond excellent. Carried by the Way, you carried forth the Way. Steve � I will miss you deeply. Homage to all the great Ancestors. Steve! Dear brother Steve. Or, as our mother would say: Steven. Many members of our family are not able to be here today, so perhaps I should say brother, cousin, father, son, uncle, grandfather, brother-in-law, nephew, (and, along with Lane, husband)�our friend. We hold you dear in our hearts. So, here are a few words of love and gratitude: I have known you since childhood and somehow, for more than sixty years, you are the same through so many changes�mentor, teacher, entertainer, philosopher, friend. Whatever our paths, in our own ways we follow footsteps you have made. Even in childhood you were wise�although willful, sometimes wild, often joyful, usually caring, usually thoughtful. Over the years you have given me lots of advice�usually I�ve asked for it�more often you�ve taught by example. I remember once playing football with neighboring kids in the vacant lot near our house. I was the little brother tagging along, probably about five and you about ten. I was playing on the team opposite yours, and bigger kids had just run right over me. You called me aside and gave me some brotherly advice. You said, �Even if they�re bigger, you can tackle them by grabbing their ankles and holding on.� A couple of plays later, you had a clear run to the goal line; you just had to get past me. I came running across the field, grabbed your ankles and held on�it worked! Down you went! You said, �What are you doing? You weren�t supposed to tackle me!� �I�m just doing what you told me to do!� I replied. And I think then you laughed, both proud of your little brother and annoyed. Advice has a way of coming back around. Over the years you�ve taught many of us to grab and hold on�and that holding on relies on its partner, letting go. Some years ago, members of our family had a summer get-together in Colorado. We decided to go white water rafting. Another raft collided with ours as we navigated the rapids and Steve tumbled out into the rushing water. As several of us grabbed hold to pull you back in, I happened to have hold of your ankles. The guide told me to let go�we couldn�t pull you back in the raft that way. I had to let go to get you back on board. Holding on and letting go. What does it mean if I�ve still got my arms firmly grasped around your ankles�holding on and letting go? When we were kids I remember you staying up late reading in bed�reading Heidegger, or Wittgenstein, Whitehead or Russell and usually snacking from a box of California raisins you kept tucked under your pillow. Perhaps the raisins called you from the wheat fields of Kansas to the vineyards of California. At any rate, the move here to practice Zen has seemed, in retrospect, like a logical and seamless journey (although I know it was fraught, at times, with struggle). I feel blessed to have been at your Mountain Seat Ceremony and now (through these words), at the closing circle of Stepping Down. For me, and all your family, these words have been intended to express our deep love and gratitude for you�our holding on and letting go�and it is with love and gratitude that I offer them. From when you first came to Zen Center in the early �70s, I always enjoyed practicing with you and always was impressed by your practice�and equally impressed with your character and unquenchable intention to do good for others and the world. And I have learned from your intent, your Dharma, and how, for many decades now, you have developed your practice and your practice with and for others, personally and in the community. It�s always been emblematic to me too, how you lived and practiced at Green Gulch, while working outside as a carpenter and sharing your income with the Center. When I heard in 2007 that you would become an Abbot of San Francisco Zen Center, I was happy and supportive (as I wrote you at the time). I knew you would bring intelligence, vision, and compassion to the demanding responsibility. Later, I was impressed that when you saw the need for a Central Abbot, you administratively and courageously did something about it. And now you are �stepping up� by �stepping down,� as you have always stepped up to every challenge I have known you to face. Oh Dear! 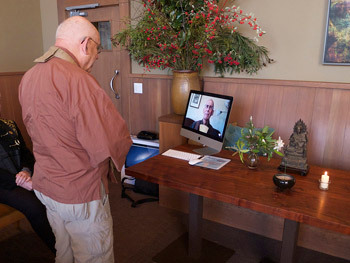 But the Zen Center�and all of us�will continue to benefit from your personal example, your Dharma Practice, and from your years contributing to the Center. Personally, I want to thank you for including me in various ways in your life and recently in the SFZC 50th Anniversary Ceremony. It really made a difference to me (and to our Colorado and European Sanghas) that I could join you and the SFZC Sangha, stay in Page Street, go to Tassajara�and join your good lecture on the Sandokai. My life is better through knowing you. Thank You! More than forty years ago you heard on the streets of Chicago that the Zen folks turned things around, and then you turned west and came to practice with us. On this occasion I celebrate with a heart filled with gratitude and sorrow the immense contributions and accomplishments of your life as abbot and your beginningless teaching and care for all life. Often seen in samue, ready for planting trees for future generations, a friendly giant with many arms and branches, you reached out to everyone of us, and to the sky, and into the roots of the great earth. The many years of your upright sitting and walking are like a hammer striking emptiness, pervading everywhere. Thus you sang to the Sangha, and the Sangha heard your song. Now as you offer your blessings and allow others to carry forth your life work, innumerable beings may receive and enjoy the fruit of your abbacy. I have had a particular appreciation of you since you arrived at Green Gulch Farm many years ago. You reminded me then of my father: tall and strong, patient and kind, gentle and compassionate, generous with your energy and effort, skillful in your interactions with others, and with a great sense of humor as well as a passionate concern for peace and justice in the world. Since then I have appreciated your strong and consistent practice, and have witnessed your maturing into a skillful and wise Dharma teacher and leader of our Sangha as Central Abbot. It is a great sadness for us all that your illness demands that you step down as abbot, and give your full attention to the Great Matter. But even as you step down, you are continuing to teach us in every interaction. Thank you for your generosity, your patience, lovingkindness, equanimity, and joy. Please know that you are surrounded by gratitude and love. With a heavy heart and a joyful mind I send you congratulations as you step down from this tall mountain. With bows of gratitude for the job you have done to maintain and support the Zen Center that has been so important to all of us in this generation, and, because of your efforts, will receive dragons and elephants for generations to come. Please take pride in what you have accomplished. I do! And now you deserve a good satisfied rest. Birth and death is truly a great mystery, here in an instant, gone in a flash. Your courage and joy in the face of sickness and death is your best and most thorough teaching. We have all been receiving this profound Dharma and taking it to heart. Having received it, none of us remains the same. Being grateful on every occasion�from now on we understand this. Thank you. In the Dharma world there is no increase no decrease no coming no going no birth no death. This is Buddha�s teaching. We will always be together, as we are now. Till we meet again face to face, I send my love. The steadfast resolve and dedication you brought to the role of Abbot still shines bright even as illness diminishes your physical energy. Even under these difficult circumstances the passion with which you still promote the well-being of Zen Center is inspiring and instructive. With deep gratitude we thank you for all your efforts to express Suzuki roshi’s Way and ensure that it is embodied in our offerings to the world. With love we thank you for your friendship and warm hearted concerns for the sangha members. Now please take care of yourself and let us take care of you. Dear Steve�Sun face Buddha moon face Buddha. Nine bows of deepest respect, love and appreciation for the innumerable offerings of your life energy, heart and spirit you have given to the world with boundless generosity and kindness throughout your life�helping with the crops together with your father; building a family; adopting Robin Clymer; practicing and teaching the Buddha Way; building material and spiritual abodes and supporting your students and the Zen Center sanghas and administration these last years with such devotion, commitment and strength�building harmony along your path. You will be leaving the world a better place albeit too early for all of us. Thank you for your capacity to be present with what is and your practice of gratitude�it is a profound teaching for us. Thank you for your life and practice. You warmed it with your smile, your trust, your gratitude. On this bright day of winter, we have gathered together in both Rohnert Park and overlooking the San Francisco Bay to respectfully mark the stepping down from the mountain of our beloved Myogen Steve St�cky. For seven years he has coursed in the Way, protecting the Sangha, and nurturing the Dharma�giving of himself without holding back. With full awareness we have offered light, incense, flowers and have chanted the Heart of Perfect Wisdom Sutra and the En Mei Jukku Kannon Gyo for Protecting Life. Our great, original teacher Shakyamuni Buddha. The complete succession of bodhisattva ancestors from whom we have received immeasurable benefit. Updates on Steve’s�health and care, as well as his reflections on practicing with terminal cancer continue to be posted on the Subtle Eye blog. Copyright © 2018 San Francisco Zen Center. Copyright © 2019 San Francisco Zen Center. All rights reserved.